A former aide to Russian President Vladimir Putin has been found dead in Washington DC, Russian officials say. Mikhail Lesin, 57, Russia's former press minister and a one-time head of the powerful Gazprom-Media Holding group, died on Thursday, they said. Russian media, quoting his family, said he suffered a heart attack. The Washington Post quoted Russian embassy officials as saying Mr Lesin's body was found in a room at the Dupont Circle hotel. It reported that police were investigating the death of a man but that he had not yet been formally identified. Last year, Mississippi senator Roger Wicker called for an investigation into Mr Lesin, saying his fortune "raises serious questions". In a letter to the US Department of Justice, Sen Wicker said Mr Lesin bought property worth $28m (£18.6m) in Los Angeles for his family after finishing work as a civil servant. Sen Wicker asked how a former civil servant would have been able to buy and maintain expensive property, and expressed concern their purchase may have involved people and groups on a US sanctions list. BBC Russian said Mr Lesin was for a long time considered one of the most influential figures in the Russian media market and in the corridors of power. Mr Lesin worked as an aide to the presidency between 2004 and 2009, when he helped advise on the creation of the news channel Russia Today. Late on Friday, Mr Putin hailed "the enormous contribution made by Mikhail Lesin to the formation of modern Russian media", according to Tass. Last year, Mr Lesin was accused of trying to force a radio station in which he was a shareholder to cut an interview with opposition figure Alexei Navalny. And Sen Wicker's letter said Mr Lesin "led the Kremlin's effort to censor Russia's independent television outlets". He resigned from Gazprom-Media last year. 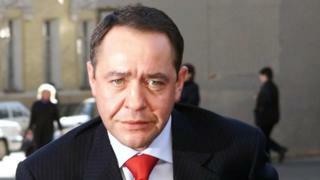 The Ria-Novosti agency said he leaves a wife, son and daughter.